Several times in the past, we have mentioned ArtStudio as an app we use on the iPad to draw, and also touch up photos. The photo touch up is along the line of what you would think of as ‘air brushing’. The drawings can be a simple line sketch to full color, high detail art pieces. One of the favorite drawing tools in ArtStudio is the ‘brush’. With that ‘tip’ on your drawing pen, you are able to draw very nice bits to use in a variety of other places. Just a simple couple lines and you have outline of a little car to put in an email or a flower in a presentation. Many folks in the office can do wonderful drawings with a simple pen, for the rest of us the brush tip brings our works alive. If you feel you don’t need all of the colors, pen types, photo touch up tools that come in ArtStudio and are just looking for a nice brush tip drawing app, take a look at Zen Brush. It does one thing and one thing very nicely… allows you to draw with several different black tip (adjustable) brushes. If you think about something as simple as a smiley face, it has a whole different life to it when done with a ‘brush’ instead of a thin constant line like a pen. 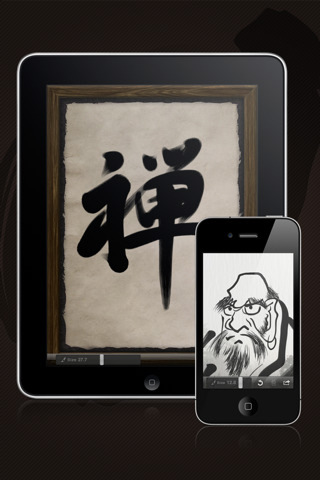 Zen Brush is a universal app so that means if you buy it once, you can install the same version on both your iPad and iPhone.